This paper is primarily meant as a position paper. After more than ten years of research on the nature of tasks, problem solving methods (PSMs) and ontologies, it appears to me that indexing PSMs by their function (task, goal, problem type) is not a good idea. The alternative — indexing by preconditions of their reuse — does not capture “what a PSM is about”. A third approach is sketched in which not PSMs, but their major components — solution generators and solution testers — are indexed by (the explanation of) their operations. Disease is a far more complex and context dependent concept than problem solving method. A. Valente and J. Breuker. Towards principled core ontologies. 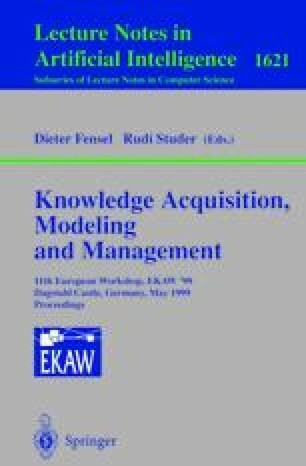 In Proceedings of the Knowledge Acquisition Workshop-96, 1996. available also at ftp://ksi.cpsc.ucalgary.ca/KAW/KAW96/73valente.ps.Z.